A Love Fest With The Leo! Bergamot & Emrys love their Leos! They have refused to eat from their bowls for days - all they want to do is play with their Leos. 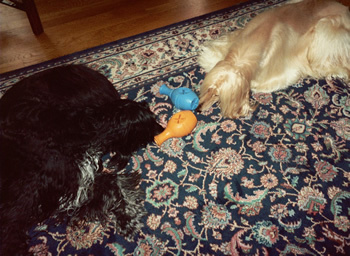 They are having a great time rolling them, thwaping them and flipping them around the house working for their treats. 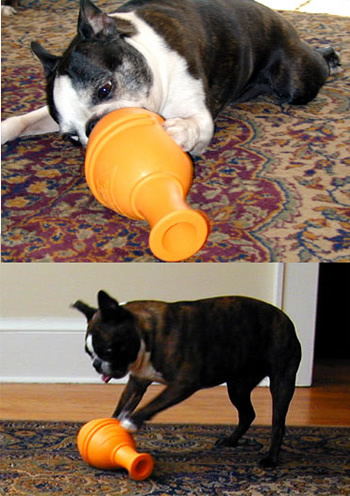 Boston Terriers are pretty demanding about getting attention & having fun - to have a toy that has these two so engaged & for so long is amazing! We can hear them thumping & galloping around with their Leos all afternoon as we work. Thanks for inventing such a fun & challenging toy! Cammy and Max LOVE them! They watched me put kibble and broken pieces of Biscuits in them the first time. When I went to lay them down on the floor, Max knocked one out of my hand and started in on it, working his way in through one of the side openings, then lifting it in his paws. I put Cammy's on the rug and started to roll it, and she immediately pushed her way in and took over the rolling duties. She looked a little like an elephant moving a log, she was concentrating so hard. Max has decided he can't be bothered to go after larger treats, but Cammy will work at getting any food, any size, any time! Now when I pick the up the Leo toys to go to the kitchen to fill them, both "kids" dance around me excitedly. Thanks for making them so happy! is so funny and has worked out a great technique. Laying on her stomach holding the Leo upside down, the neck between her paws, she sticks her lower jaw through the big X in the bottom. Then she throws her head up in the air over and over until a piece falls inside of her lower jaw (which is still inside). Then she rolls over on her back and holding the Leo's neck with her two paws she pulls out her jaw, scooping that treat up with her. When she's done chewing she starts all over. It takes her a long time to get the treats out this way. Not a lot of calories for a whole lot of work. I love it! Chanda-Leah, The Worlds Smartest Dog, loves Leo! 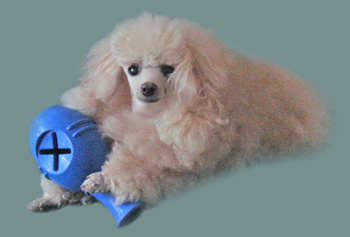 I thought you would like to see just how much Chanda loves her Canine Genius Leo toy. I put meat balls inside of it before I go to church...and she has a great time playing with it. It certainly keeps her amused! Watch a video of Chanda-Leah playing with her Leo. I love my Leo toy! Last September "Piper" (my Airedale) and I attended a 4 day dog retreat. Since she loves toys, I bid on one of your Canine Genius toys at a silent auction. Never having seen one before, I thought if it lasted a week and she enjoyed it, that would be great. I thought another toy was her favorite, but I was very wrong! She LOVES your toy and carries it everywhere. Recently we went for a 3 day training session and the Leo toy went along. What a sight to see an Airedale prancing through the Holiday Inn with that toy in her mouth. As you can see Piper is enjoying her great toy! 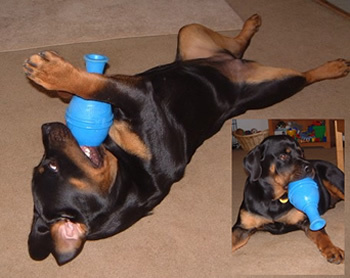 She is a strong, playful dog and this toy, although showing some wear, is still in great shape. Believe me, she has put it through a true test of durability! She carries in outside with her and comes racing back through the doggie door with it in her mouth. I think she is afraid we will take it for our own to play with. It makes me so happy when someone designs a toy that is not only safe but so much fun for the dog. She has to work very hard to get the treats out so it keeps her out of mischief! 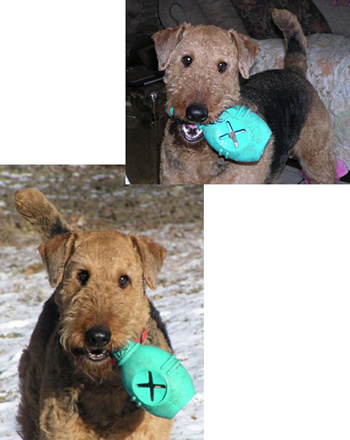 Thanks for such a durable toy that can withstand the jaws of an Airedale. My Leo's arrived today - fab!!! Here are some pics of Jordie. Thank you for inventing something different. My 8-year-old Lab Maxie has arthritis and can't run and play as vigorously as she used to. I'm constantly looking for new things to entertain her. She's very intelligent and likes working out new things. She loves the Leos. They dispense treats at just the right rate to keep her interested and busy. Thanks again for inventing something different. 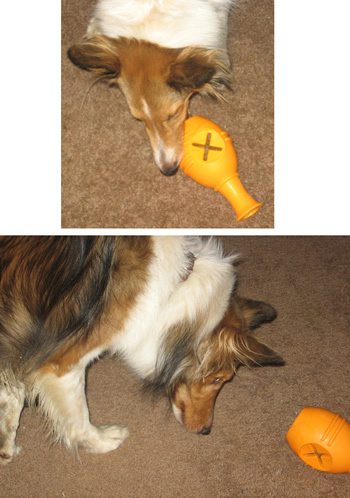 Maxie gets bored with the same old toys. Keep me posted on any new items you come up with. I hope you will come up with more toys for intelligent dogs. 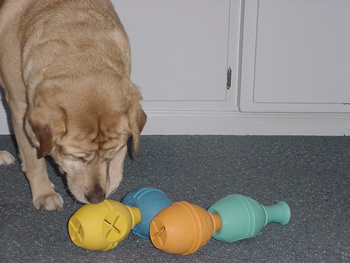 I recently ordered a large Canine Genius for my lab and am now ordering several more... what a wonderful product! 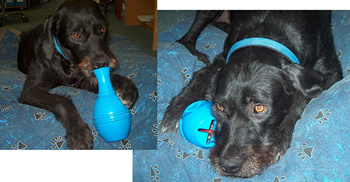 I had been searching for a toy that would occupy my intelligent dog! I wanted to share these photos with you... could a "Feline Genius" be in the near future?! My cat is fascinated with the toys! Stay tuned - a "Feline Genius" version of the Leo toy is coming soon! 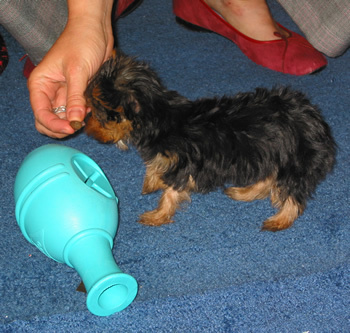 An 8 week old Yorkshire Terrier puppy. First off, I want to let you know how much I, and my dog Spenser, like the Leo toy. I saw them in a Modern Dog magazine and ordered three. Spenser tends to scarf his food down and then spend the evening looking for something to do or bark at. I now put his dinner in a Leo toy and have a happy and busy dog (and cat—because Spenser isn't chasing him). 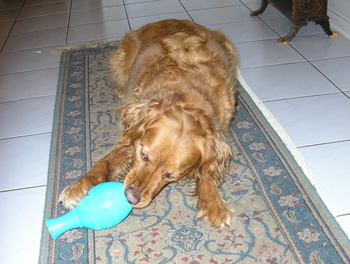 They are a great toy for a bright and energetic dog. © 2006-2019 Canine Genius, All Rights Reserved.